Prehistoric Week: Looking Back At THE LAND THAT TIME FORGOT | Warped Factor - Words in the Key of Geek. Here is a movie that I will never forget. It seems to be burnt into my memory thanks to countless viewings growing up, a childhood slightly obsessed with dinosaurs, and that ending. 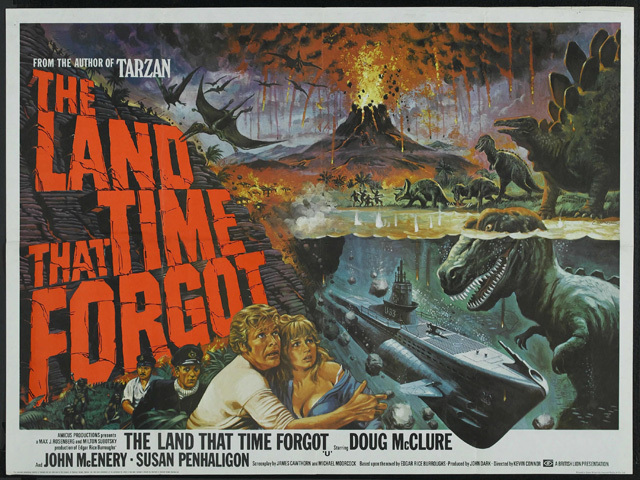 The Land That Time Forgot is based on the 1924 Edgar Rice Burroughs novel of the same name. Michael Moorcock adapts the story and he sticks pretty close to Burroughs work, wisely keeping a lot of the beats in place. Set during the World War I era, the adventure begins with Doug McClure as Bowen Tyler narrating the events, and we see a sailor throwing a bottle with a written manuscript inside it into the sea, hoping for it to be discovered later. This is quickly followed by the sinking of the twenty thousand tonne British freighter Montrose by a German submarine. The survivors manage to find their way aboard the sub as it surfaces and subdue the German Captain and his crew. 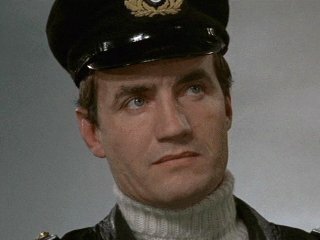 Tyler, who along with Lisa Clayton (Susan Penhaligon) were passengers on the ship torpedoed by Captain von Schoenvorts (John McEnery). It's McClure, the American star, who convinces the British crew to take over the surfacing submarine, and he who takes command of the U-boat hoping to sail it to a British port. However, German officer Dietz gets loose and smashes the sub's radio. Dietz being played by future Master, Anthony Ainley. The two crews decide they need to work together as their rations and water supply are at minimum, particularly after Tyler's maneuver of torpedoing a German supply ship that was to rendezvous with the submarine. It's pretty convenient to learn that Tyler's father had a hand in designing submarines, which in turn gave him an advantage in knowing the sub's machinery and operating mechanisms. What were the odds? Off course and running out of fuel in the South Atlantic, the U-boat and its combined crew happen across an uncharted sub-continent called Caprona, a fantastical land of lush vegetation where dinosaurs still roam, co-existing with primitive man. 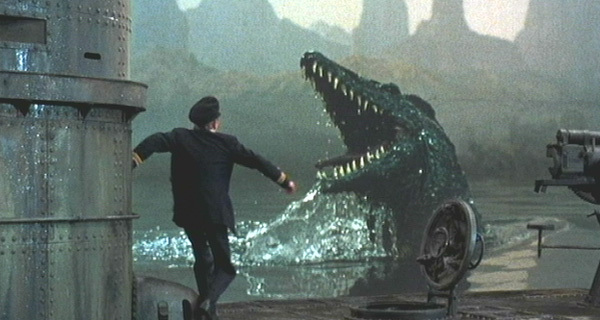 Encountering one of these Neanderthal types who becomes their guide, the seamen run across a variety of dinosaurs from earth's ancient past, including pterodactyls, a diplodocus, a plesiosaurus and a couple of allosaurs that they summarily shoot to death. You know, even as a child this didn't sit right with me. Why would the characters begin firing at creatures that aren't posing any particular danger? Perhaps in an attempt to elicit the viewer's sympathy? I just don't know. If so then it doesn't really work in this regard, as another encounter with a styracosaurus ends with the dying creature shedding a tear. Biologist Lisa Clayton proposes that the land they've encountered is home to animals and human-like beings which represent the various stages of evolution that Earth has gone through. Tyler surmises that if they continue traveling in a northerly direction, they would eventually come across more advanced creatures. Caprona also includes reserves of oil which, if the Germans and British can work together, can be refined and enable their escape from the island. With the submarine working again, and a sudden outbreak of volcanic eruptions across the island, Deitz abandons Tyler and Clayton in Caprona and attempts to escape. The pair can only look on in astonishment as the vengeful German leaves them stranded, but their amazement is tempered when they see that the sub cannot function in the boiling waters caused by the volcanic eruptions and attendant upheaval, quickly causing the U-boat to sink. What an ending. It's really not they way you'd expect it to go, certainly not your traditional 'all the good people make it home safe' scenario. We're left with a hint of an Adam and Eve type new beginning for Tyler and Clayton, as they continue to make their way north, not knowing what awaits them. The movie closes with a shot of Tyler throwing the bottle, with the manuscript inside it, as seen in the beginning of the movie, hoping that one day it will be discovered. Doug McClure (who seemed to guest star in almost everything on television during the 70s and 80s) makes for a good hero character, he's both likable and capable enough to carry the movie. But The Land That Time Forgot is all about the dinosaurs, and the early pre-Caprona scenes drag a bit as you just want them to get to the uncharted land and get on with it. The effects, I guess, are pretty typical for the time. Naturally, 1975 movie dinosaurs can't compare to the ones seen in Jurassic Park almost 20 years later, but they were the equal, if not better, than the Godzilla films that were still popular at the time. 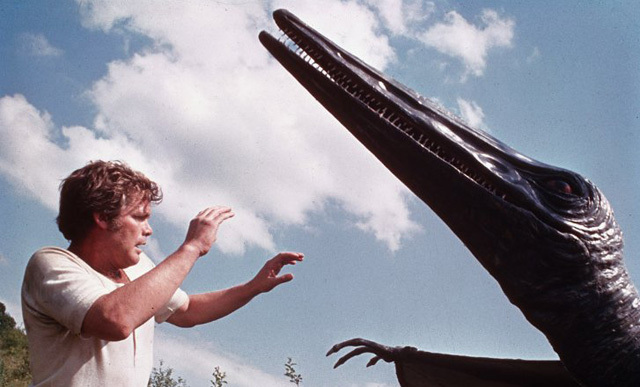 It's pre-CGI days so the dinosaurs are realised through puppetry and are kept out of sight enough to be effective. The Land That Time Forgot is an imaginative piece of fantasy adventure. What it lacks in budget and occasional acting talent (hapless Keith Barron! ), it makes up for with great pacing. The dinosaurs are successfully teased and the mystery of Caprona is allowed to build, with plenty of excitement along the way. 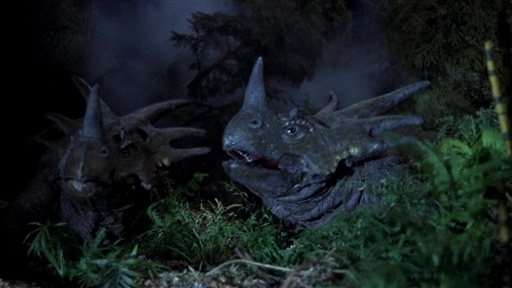 The very fact that it has a sense of wonder and a truly haunting ending sets it apart from many other creature feature movies, leaving you with a film that is a lot more memorable and enjoyable than a lot of the other dinosaur films that have been released over the last 40 years. By day, an ordinary bloke in a dull 9 to 5. By night, a tired ordinary bloke. Martin still hasn't worked out what he wants to do when he grows up. He is currently 49.